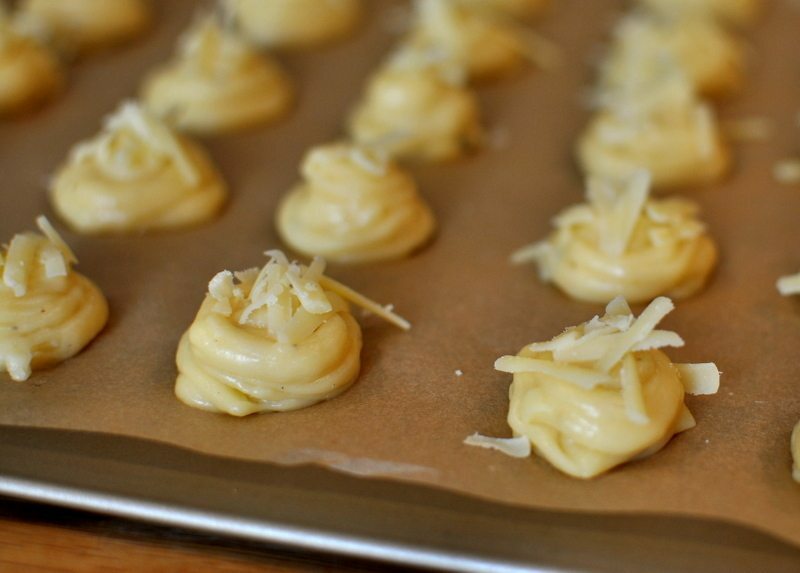 When I’m searching for a use for cheese “ends” lingering in the fridge, I’ll use them in gougères as a pre-dinner snack for my children. Gruyère is the classic choice, but a sharp cheddar works nicely, too. Classic gougères are made with Gruyère, but I like the bite of extra sharp cheddar just as well. Another option is using a combination of parmesan and sharp cheddar. In a medium saucepan, stir together the water, milk and salt. Add the butter and bring to a boil. Turn the heat down and add the flour, stirring with a wooden spoon until a smooth dough forms. Stir over low heat for approximately two minutes or until the dough pulls away from the sides of the pan. Scape the dough into a bowl and let cool for two minutes. Add the eggs, one at time, making sure each egg is fully incorporated before adding the next egg. (This can be a bit of an arm workout but is an important step.) Stir in the cheese, pepper and nutmeg. There are several options for shaping the dough into puffs. You can transfer the dough to a pastry bag with a ½-inch round tip and pipe tablespoons onto the prepared pans. If you don’t have a pastry bag, you can clip the corner of a large, plastic freezer bag to simulate a pastry bag and pipe tablespoons of dough. Or, you can drop the dough in spoonfuls for a more rustic look. Sprinkle each puff with cheese. Bake for 22 minutes or until puffed and golden brown. Serve hot or at room temperature. 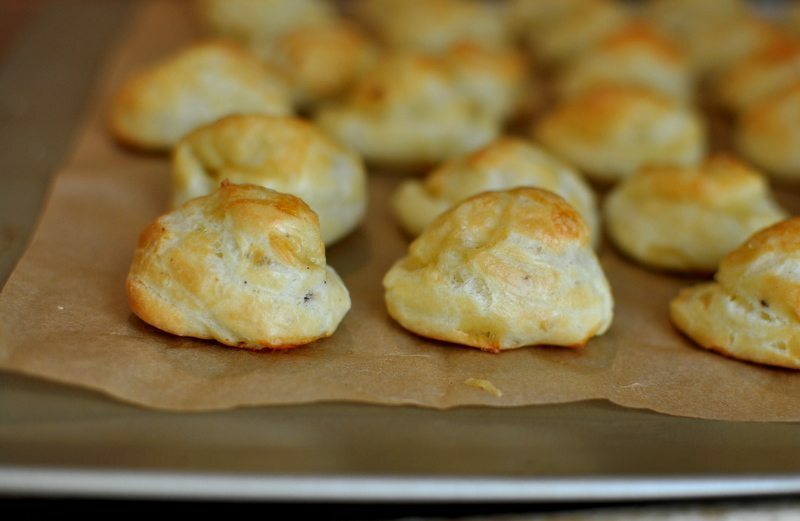 To Make Ahead: Let the puffs cool then freeze them in freezer bags. To reheat, transfer to a baking pan and bake in a 350-degree-F oven until hot. 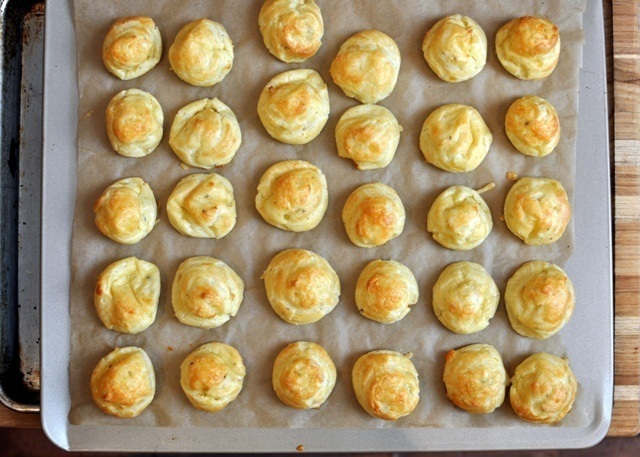 Adapted from Alain Ducasse's Gougères, published in Food & Wine.